Experience total down time while recharging your batteries- Free yourself from daily work and family stress with our breathtaking accommodations at the luxurious Paradise Pointe 7C. Pamper yourself while reading a book with gorgeous views of the Atlantic Ocean from the North Myrtle Beach rental of Paradise Pointe 7C. The Cherry Grove section of North Myrtle Beach, SC is a pristine stretch of waterfront land that is bordered on one side by the Atlantic Ocean and on the other with the salt marsh inlet and all the channels that run up behind the residential neighborhood. This elegant vacation destination awaits your arrival at Paradise Pointe 7C. 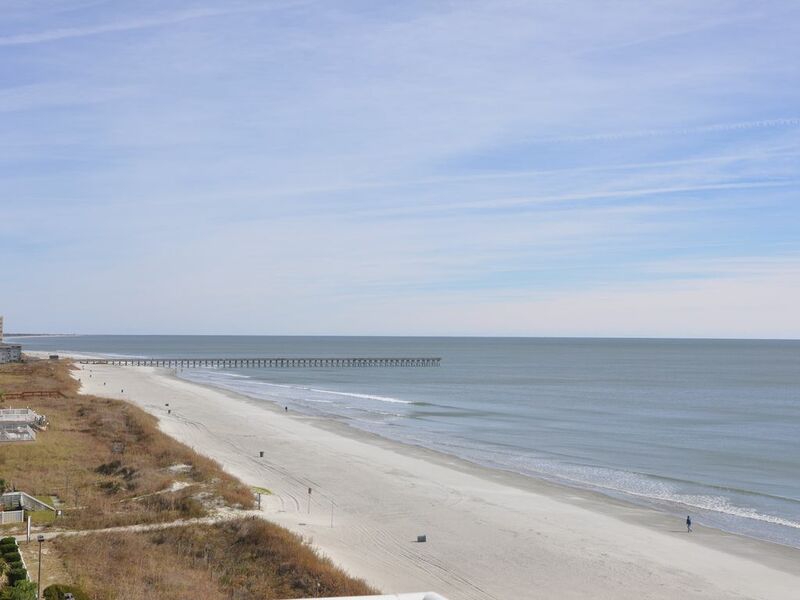 Conveniently located on the oceanfront in Cherry Grove, this three-bedroom, three-bath family condominium in North Myrtle Beach, SC boasts spectacular views from the balcony, living room and master bedroom. A breakfast bar separates the full kitchen from the charming dining area at this North Myrtle Beach condo rental. The living room extends out to the oceanfront balcony, so sunshine streams inside, and beckons you to go outside. For the ocean breezes. This well appointed family condominium offers oceanfront recreational options at the Paradise Pointe sundeck. Nestled along the bustling beachfront, Paradise Pointe features an indoor/outdoor swimming pool, kiddie pool, lazy river and lounge area. Plus it is only steps away from the white, sandy beach that will become your backyard for the duration of your North Myrtle Beach vacation. Indulge in the convenience of these on-site amenities and then take advantage of the close proximity Paradise Pointe 7C enjoys to all the famous Myrtle Beach attractions and North Myrtle Beach, SC amusements. About 100 golf courses are in the Myrtle Beach area from novice to professional all reasonably priced so grab your clubs and hit the links. Water sports, such as parasail rides, Sea Doo rentals and banana boat rides are a must on your North Myrtle Beach vacation to-do list. World-class seafood restaurants are everywhere and feature the fresh catch, raw oysters, fried shrimp and clam chowder. Eat like locals when you vacation in North Myrtle Beach, SC and treat yourself to locally caught seafood everyday. Bring your family to the Cherry Grove section of North Myrtle Beach, SC for your next beach vacation and enjoy close proximity to live theatre entertainment, water parks, amusement rides, fishing charters and boat rentals. Paradise Pointe 7C is a veteran and family owned and operated property with three bedrooms and three baths. The well-equipped kitchen, convenient dining area and comfortable living room open to the oceanfront balcony at this North Myrtle Beach property rental. You will love the seating on the oceanfront balcony at this vacation rental. Move right into this North Myrtle Beach rental and live like you are at home. There is a washer/dryer unit in this condo in North Myrtle Beach, SC and several DVD players, too. Bring your family to Paradise Pointe 7C for your next North Myrtle Beach vacation. You will not regret it! For over 30 years, we have been vacationing with our family in the local Myrtle Beach area. Even while traveling the world as a Navy family, we always looked forward to spending family time in Myrtle Beach. We pride ourselves in providing an well managed property that is clean, modern and well appointed so you come back year after year. We like you are all very much aware of the financially challenging times in which we live these last few years. Those times when we would take two big family trips a year are long gone, so picking that special place and time for that family get away needs to be really special. We remember growing up with that summer vacation with our whole family at the beach was one of the most important times of the year. Paradise Pointe is just the type of place our family would look to rent for vacation and I am sure you will find our place truly special for making those family memories. Because the times are so financially challenging, the thing to do is to make sure we have the lowest rental rates. We continually check and recheck our competition to make sure we have the lowest price. So here is what you need to do to get the lowest price on a beach front condo. It will not do any good to say ‘my budget is such and such, or will you give me a 10 per cent discount or $100 off’. If you want a lower price, you must do your homework. Email me the lower price you find and the web link. We need to make sure we are comparing apples to apples. Expect to be rewarded for your efforts with a lower rate than the one you found. Lastly it always helps to identify yourself as a wounded warrior. As retired Navy, you hold a special spot in our hearts. Just walk out on the balcony! Nice, clean, and comfortable and felt like home. Debbie and Ray went out of there way to keep us informed during hurricane and moved out dates until hurricane over. Would book again. Libby we are so glad you liked our condo, thank you for the kind words. We look forward to your return. Enjoyed the condo so much!!!! We are so glad you loved our condo! The owners of this condo were very communicative and easy to work with. Would rent one of their properties in the future. Ray and I want our guests to feel that they can reach us easily and answer any questions or concerns quickly. We appreciate you kind words. You couldn't ask for a better view of the ocean from the balcony. The place is nicely decorated. The chairs and toys to use at the beach and pool were a nice treat. You are just steps away from the beach. We really enjoyed our stay here. We would love to come back on our next trip. Thank-you for the outstanding review. We try very hard to make sure your stay is pleasant, enjoyable and worry free. We look forward to your next visit! Our stay at Paradise Point June June 30-July 7, 2018 in unit 7c was as perfect as we expected. We were lucky enough to meet the owners Debbie and Ray while we were there. We just can’t say enough about the condo and the owners. This condo was very clean. The ocean view was amazing! Debbie and Ray will always get our business!!!! Thank you for an amazing vacation! Thank-you for the wonderful response. We try hard to make sure the condo is clean and has all the conveniences of home so our guests can have a great vacation! The perfect beach spot, calm, peaceful and tranquil! Our family had a wonderful time and enjoyed this condo very much. Had all the amenities we needed! Ray and Debbie are amazing! They responded to our door lock hiccup (quite sure it was user error) so sweetly. Thank you for an amazing property and vacation! We will definitely see you again. Thank you for the 5 Stars.... We try hard to make sure you have a great stay. Hope to see you again soon. We use seasonal pricing. Time of year and availability determines the rate. Early bookings recieve the biggest discount. We rent to families and responsible adults only. No house parties. Note: Rates above are rental rates prior to addition of taxes and fees. Weekends and holidays may be slightly higher. Existing reservations with prepayment are excluded.